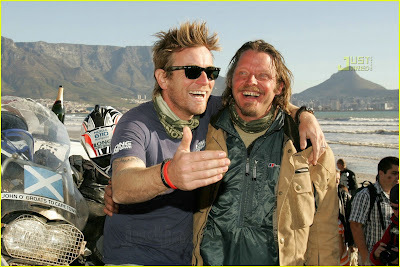 The Motorcycle Diaries: Ewan McGregor and Charlie Boorman take the Long Way Round. In between acting gigs, Ewan McGregor likes to take “mind-expanding” trips. 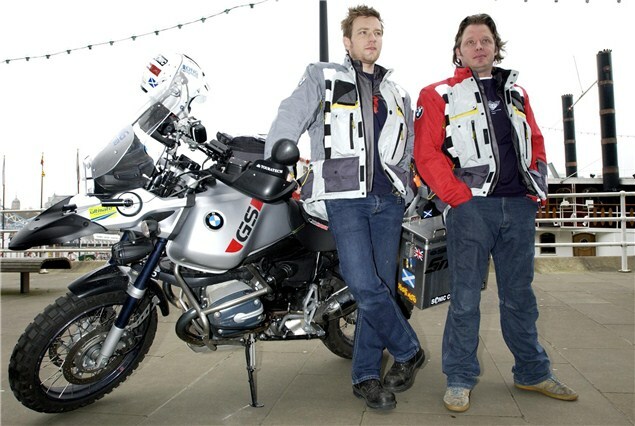 He does that with well-documented motorcycle journeys: The first one was in 2004, another occurred in 2007, with a third in the planning stages. 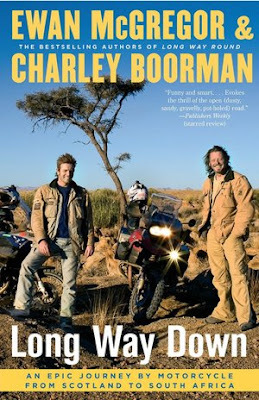 The biker breaks — each commemorated with books and TV shows — allow him to return to his craft with a vitality he demands of himself. Certainly, the 40-year-old’s latest movie agenda underscores the effect of those rejuvenating jags. The Los Angeles-based McGregor has headlined or co-starred in 14 films since his last motorcycle sojourn, and he’s in the process of shooting a new movie in London. “I’m playing a knight in Bryan Singer’s version of Jack and the Beanstalk,” he says of the live-action, 3-D adventure called Jack the Giant Killer. Typically, McGregor manages to move from blockbusters to low-budget independent features, but even he agrees he’s picked up the pace over the past four years. And he enjoys mixing it up. He had a main role in Tom Hanks’ star vehicle Angels & Demons. He co-starred with George Clooney in anti-war satire The Men Who Stare at Goats and he played opposite Jim Carrey in the bizarre romantic comedy I Love You Phillip Morris. He was also featured in the Roman Polanski mystery The Ghost Writer, and he had fun with Emma Thompson in her family fantasy Nanny McPhee Returns. Another McGregor change of pace arrives with the melodrama Beginners, opening June 17. Written and directed by Mike Mills, the semi-autobiographical movie tells the story of Oliver (McGregor), a frustrated artist trying to cope with two relationships in flux. One is with a girlfriend (Melanie Laurent), who has commitment issues. The other has him adjusting to the fact that his father (Christopher Plummer) has announced he’s gay and terminally ill. The father-son portion of the narrative is a great deal more personal for the writer-director, who did, indeed, reassess his relationship with his gay father after he came out just before he died. “Mike was writing about his own experience, but he was also writing about people in our generation, and all the issues we have with love,” McGregor explains. There’s no question that the most poignant part of the film is the father-son dynamic, emphasized by the easygoing rapport between McGregor and Plummer, the award-winning Canadian actor. To prepare, Mills preferred that the two actors bond by hanging out together, rather than rehearsing the dialogue. While McGregor’s film career has had its ups and downs, he seems to have a clear focus, too. The Scottish lad dabbled in British TV roles before scoring the lead in the 1995 film Shallow Grave, then earning great reviews as a heroin addict in the international hit Trainspotting. A few years of low-profile or lacklustre movies changed with his role as the young Obi-Wan Kenobi in 1999’s prequel Star Wars: Episode I — The Phantom Menace, followed by 2002’s Attack of the Clones and 2005’s Revenge of the Sith. Other notable moments arrived in 2001, with his performance in Baz Luhrmann’s postmodern musical Moulin Rouge! and Ridley Scott’s combat picture Black Hawk Down. In 2003, he co-starred in Tim Burton’s stylized fable Big Fish, and shared screen time with Scarlett Johansson in Michael Bay’s 2005 sci-fi action hit The Island. The two most famous pupils of the BMW Off Road Skills Course are Ewan McGregor and Charley Boorman, who last year rode from London to New York on a pair of R1150GS Adventure BMWs and filmed their trip for the TV series Long Way Round. I asked Boorman about the value of the training in some of the toughest conditions any off-road rider is likely to find: "Ewan learned a lot as he'd never ridden off-road before, picking up all the basic techniques. I've been riding since I was about seven - on a farm in Ireland, doing some motocross, enduro and so on, although not proper competition - so I found it a bit easier. But what the course did for me was validate what I was already doing and help me understand it. It gave me a lot of confidence on the 1150 too - sometimes this was a bit easier than the 650 in fact, and it was surprisingly nimble. 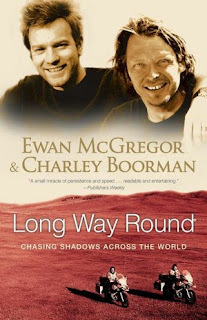 "We covered all sorts, like what to do if the bike was dropped in water - unscrew the spark plugs, let the starter pump the water out, and don't worry about getting it all out - but Ewan was the first to drop his bike on a river crossing. Getting the bike out was the hardest part; getting it running again was easy. "The techniques for picking the bike up were very useful, but every single bit of information they taught us, we used a thousand times over on the trip. I'd say do this whatever bike you're travelling on. Simon and Nick have such a good attitude: it's about having a laugh, not being self-conscious about falling off. They teach you so much. I'd like to go back again, just to see how much better I am after the trip!" Reimbursement based on the kulutusluotto respond This loan repayment period within the kulutusluotto Act is usually in the predetermined reimbursement timetable. If a person gets to be a income as soon as inside of a thirty days, he or she have to pay off this pikalaina within a bare minimum time-frame associated with 25 for you to 85 days to weeks. If you receives income a second time within a 30 days, she or he will need to settle a pikalaina inside of Twenty-three for you to 22 nights on the time one is compensated the actual pikalaina. Ultimately, if pay comes into play regular and also bi-weekly, she or he will have to repay a pikalaina throughout 23 to help 36 days to weeks. an extremely well written article. I'll make sure to bookmark it and return to read more of your useful info. Thanks for the post. I'll certainly return. This is an extremely well written article. I'll make sure to bookmark it and return to read more of your useful info. Thanks for the post. I'll certainly return. Simply wish to say your article is as astonishing. The clearness in your post is just great and i could assume you're an expert on this subject. Fine with your permission let me to grab your feed to keep updated with forthcoming post. Thanks a million and please continue the enjoyable work. Your method of explaining the whole thing in this piece of writing is genuinely fastidious, every one can without difficulty know it, Thanks a lot. Thanks on your marvelous posting! I quite enjoyed reading it, you're a great author. I will be sure to bookmark your blog and definitely will come back from now on. I want to encourage that you continue your great writing, have a nice afternoon! time to be happy. I've read this post and if I could I wish to suggest you few interesting things or advice. Perhaps you could write next articles referring to this article. I wish to read even more things about it! Heya i'm for the first time here. I came across this board and I find It really useful & it helped me out a lot. I am hoping to provide one thing back and aid others like you aided me. Greetings! I've been following your website for a while now and finally got the bravery to go ahead and give you a shout out from Dallas Tx! Just wanted to tell you keep up the fantastic job! blog (I also love the theme/design), I don't have time to look over it all at the moment but I have saved it and also added in your RSS feeds, so when I have time I will be back to read a great deal more, Please do keep up the excellent work. article. I'll be sure to bookmark it and return to learn more of your helpful info. Thank you for the post. I'll definitely return. i got here to return the favor?.I'm trying to find issues to enhance my website!I assume its good enough to make use of a few of your concepts!! Are you looking for repair your Mot in Basildon ? Just go on ptsgarageservices.co.uk and contact with us to repairing your mot in basildon. daily basis. It's always exciting to read through articles from other authors and practice something from their websites. This comment removed by an administrator.